I have tried flipping things around and I have found that I can't get the following combination running together. Cable from PC -->Catweasel-->cable to drives. I have a DBIT adapter for the 8". 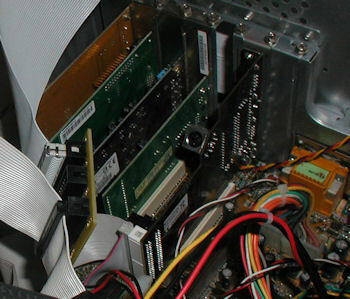 The twist end of the cable is installed on the intended A drive. BIOS matches drive types (A=5 1/4 360k and B= 5 1/4 1.2m). The terminator is in the B drive. 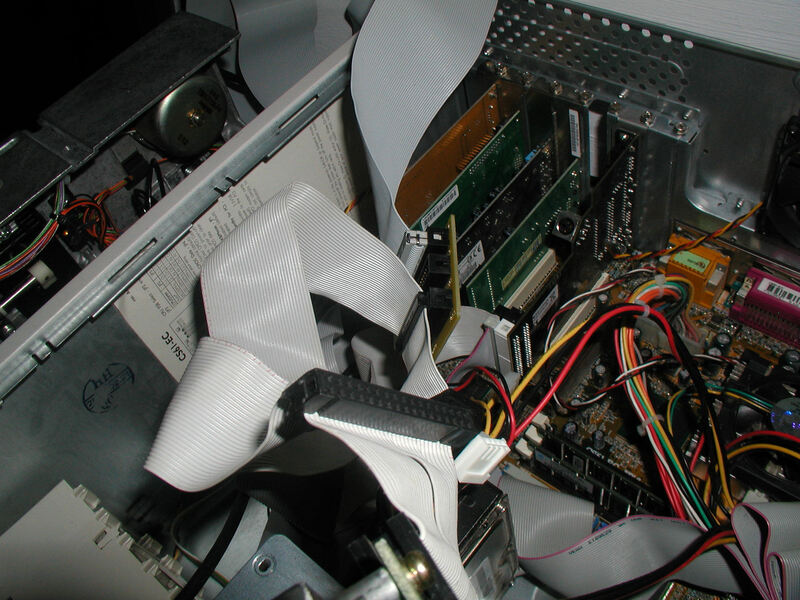 The Qume passes tests and reads disks. Although the Tandon is recognized as the B drive, it always returns a "drive not ready" error in DOS or a "no interrupt from FDC" from the catweasel. Only when I detatch the drive cable from the back of the Qume and run it alone will the Tandon 848-02 pass tests and read disks. Why can't these play together? So I was wondering before I go away to Easter dinner ...Is the READY signal from the Tandon not "strong enough" when another drive is in the loop? Or did I discover an unfortunate limitation of the "simulated 5 1/4 1.2M" drive using the DBIT? Is it the Catweasel MK4Plus? Again... the 8" seems to work as I expect alone. why? I got some tips from ChuckG of vintage-computer.com, he said it's not the ready signal it's the Index pulse to watch for. So I was thinking...I thought I read someplace that IBM branded QumeTrak 142's were not ideal choices for this kind of work. After not being able to find anything wrong with the Tandon 848-02 (checked P1 Index pulse - seems ok)....If the 8" drive works as intended whenever the 5 1/4 drive is unplugged, maybe I should try another type of 5 1/4" drive. Maybe the 5 1/4" drive is interfering with the index pulse coming from the 8" drive somehow, given their on the same cable. Maybe there is no imagined "terminator conflict" or something having to do with the DBIT adapter and they're just fine. So, going on this hunch I made sure there was a terminator in the 8" drive (B/1) and switched in a Teac YD-580 in place of the QumeTrak 142. It worked. Now for "catweaseling" I have an 8" and a 5 1/4" drive on the same system. The BIOS on my Pentium III does not allow for a 3rd drive (3.5"), at least not in an obvious way. My disk imaging station is a no-name (label on board is CS61-EC rev A) P-III running a dual boot DOS 6 and Windows 2000. 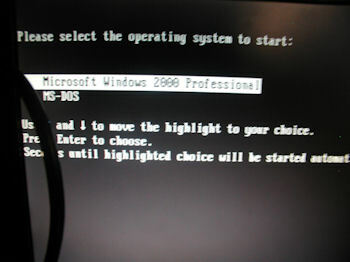 On the DOS partition I have Dunfield's image disk utilities and on the 2000 partition I have the catweasel utilities. With this set up in theory I can image most any kind of 5 1/4" and 8" DSDD disk, and many SS disks. I have a 96TPI drive I can also add into the mix if need be, but I have not tested it yet. I don't expect to read hard-sectored disks, but I will try that too. Later ChuckG said he has no issues with his catweasel and various drive combinations. I'd get a second opinion before giving up on the Qume 142, I may have to try another one. 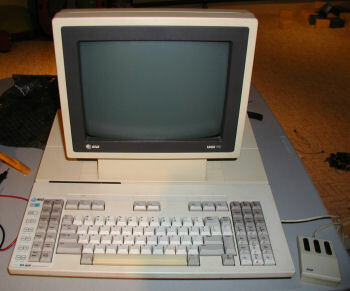 OR maybe there is something about a QumeTra 142 OEM used by IBM (with IBM label on faceplate). Always more research can be done in the drive world. Not an easy thing to master. Note to self, When I get around to trying a 100tpi drive use DS(Q)D 720K floppy 3.5 see if that works. 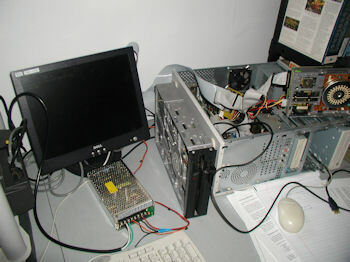 Pentium III computer with Tandon TM 848-02 8" and Teac YD-580 5 1/4" drive used for disk imaging. I ordered a 24/5V power supply for the Tandon drive. Click for larger view. Closeup of the mass of cables inside. Note the Catweasel MK4, and DBIT 5 1/4" to 8" adapter. Click for larger view. Here is a picture of the dual boot options. DOS 6 is used for Dunfield's ImageDisk, Windows 2000 is used for the Catweasel ImageTool program. The BIOS is set for a 360K 5 1/4" drive A and a 1.2M 5 1/4" drive B. The system treats the 8" Tandon drive as a 1.2M 5 1/4"
Disk images will be uploaded to a separate location. So far I have made quite a few from various systems.